WE DID IT: Violence Prevention Standard Adopted! On October 20, the Cal/OSHA Standard Board unanimously voted to adopt the first workplace violence prevention standard for healthcare workers in California. Our hope is that this Standard will be used as a template at the national level. 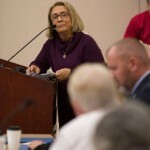 In 2010, Ingela Dahlgren, RN, and Kathy Hughes, RN, attended a rally to honor the memory of Dona Gross, a psychiatric technician at Napa State Mental Hospital, who was strangled to death by a patient while at work. This atrocity was the latest in a string of violent incidents which inspired the beginnings of a workplace safety movement which continues today. While focused effort under strong leadership underpinned this successful campaign, the true heroes in the battle for a safe work environment are all the nurses and the health care workers in this great state of California. What makes this victory so important? 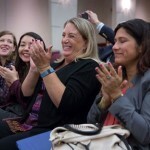 Sharing their personal accounts of attacks, threats, and harassment in the workplace, healthcare workers retold their stories before the Cal/OSHA Standard Board to bring attention to the urgent need for regulatory change. 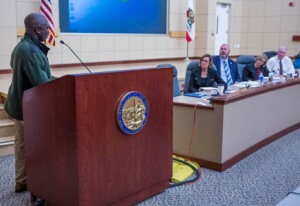 These heart-breaking stories propelled the Cal/OSHA Standard Board to approve improvements in their regulations governing the management and operation of healthcare facilities throughout California. This new Cal/OSHA Standard applies to most employers of nurses, health care workers, and the communities they serve in California. With this new regulation in place, Cal/OSHA is ready to implement workplace violence prevention measures in California and soon for the rest of the U.S. 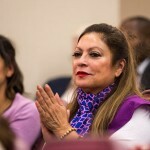 The men and women who shared their stories are to be applauded for motivating the Committee to consider the importance of this issue at a very personal level. 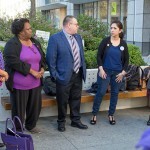 For the last couple of years, many SEIU Locals and the California State Council have supported our campaign financially and by actively participating in our rallies and events. We are very grateful for all their support and encouragement. We want to thank you again for your participation over the years! In March of this year, unrelenting members of Local 721 accompanied by other professions including: Social Workers, Medical Case Workers, Surgical Technicians, Physical Therapy Aid, Licensed Vocational Nurses, Registered Nurses, and Nurse Practitioners shared with Dr. Katz, Department of Health Services for Los Angeles County, their alarming stories of overt bullying and silent retaliation at the hands of managers. Following-through with action, Dr. Mitch Katz put management and administration on notice by circulating a memo condemning bully behavior in the workplace. And it doesn’t stop with Local 721. In June of this year, the Joint Commission published downloadable guidelines which further clarifies how “bullying” is to be defined, identified and treated separately and distinctly from illegal harassment. 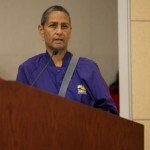 SEIU Local 721 demonstrates how standing together, we remain strong in this blog post showing how MLK Outpatient Center’s CEO responded to the Dr. Katz memo by endorsing and expanding the message specifically to this facility. Kathy Hughes, RN was given the closing quote in an article which appeared on the June 19th in Business Insurance(1). 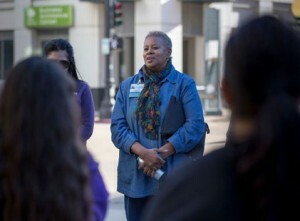 “We want what we’re doing in California to be the template and the driving force behind, hopefully, getting something similar to this done nationally because I don’t think people realize the prevalence of workplace violence in health care,” Ms. Hughes said. This quote echoes a central theme of the 2016 Legislative Conference in Sacramento “Nurses Leading the Way to Healthier Communities”. 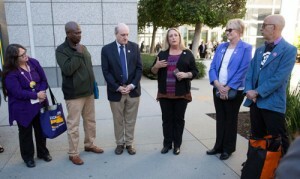 SEIU Nurse Alliance of California members can Click here, or check email to see the full article. (1) Business Insurance is the authoritative news and information source for executives concerned about risk and the impact on their business. 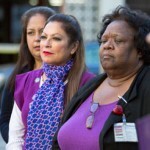 Since 2012, the Nurse Alliance of California has lead the charge for the new Cal/OSHA standard to protect healthcare workers from workplace violence, which is expected to pass this summer. Attached is a background summary and related Government Accountability Office (GAO) report & fact sheet for your reference. Next month we will be hearing from Mark Catlin, Occupational Health and Safety Director for SEIU at the 2016 Legislative Conference in Sacramento on May 3rd & 4th. All three documents are linked below and downloadable in PDF format. 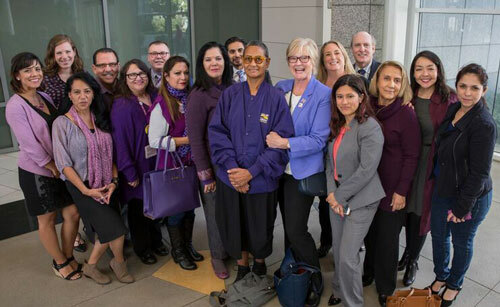 The SEIU Nurse Alliance of California led the charge in California, with the support and cooperation of SEIU local unions and the SEIU State Council of California, by petitioning Cal/OSHA. Here are some helpful links for more information; Nurses should be especially intrigued by the compilation of quotes.